A team from IE Business School has competed in the 2nd Annual Hult Global Case Challenge – a call to action for the world’s brightest business school minds to tackle the world’s most pressing issues. The competition, in partnership with the Clinton Global Initiative and Water.org, an organization co-founded by Gary White and actor Matt Damon, focused on developing solutions to the global water crisis. Hult will make the winning idea, along with a $1 million prize, available to Water.org to accelerate access to clean water and sanitation. The teams were selected from more than 1000 applications. Most schools had multiple team applicants with one or two teams from each school being chosen. 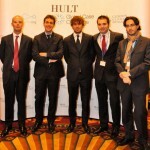 Regional competitions took place on March 5 on Hult’s five campuses in Boston, San Francisco, London, Dubai and Shanghai. IE Business School’s team competed in London and the team members included five IMBA students: Vittorio Lapiana, Alberto Riboni, Riccardo Corti, Federico Marafante and Marco Moncada. Our team won the first heat of the competition among 8 other teams from top European business schools and we then had the opportunity to present in front of all the jury and participants for the European final, reaching 4th position out of a total of 32 teams. Even if it was a great result, we missed the opportunity to fly to NY for the worldwide final chaired by Bill Clinton. It has been an amazing experience and we hope that an IE Business School team can reach first place next year!